I used to love Thanksgiving: the food, the family, and the fellowship. But now I kind of dread it. Gone are the days of civil and non-partisan Thanksgiving tables. Now we wear our red hats or bicker about the midterms, we jockey seats to surround ourselves with those of the same persuasion, and we find ourselves replenishing our wine with every passing political anecdote. Almighty God, Father of all mercies, we your unworthy servants give you humble thanks for all your goodness and loving-kindness to us and to all whom who have made. We bless you for our creation, preservation, and all the blessings of this life; but above all for your immeasurable love in the redemption of the world by our Lord Jesus Christ; for the means of grace, and for the hope of glory. And, we pray, give us such an awareness of your mercies, that with truly thankful hearts we may show forth your praise, not only with our lips, but in our lives, by giving up ourselves to your service, and by walking before you in holiness and righteousness all our days; through Jesus Christ our Lord, to whom with you and the Holy Spirit, be honor and glory throughout all ages. Amen. The Lord is my shepherd, I shall not want. He taketh me to lie down in green pastures; he leadeth me beside the still waters; he restoreth my soul. He leadeth me in the paths of righteousness for his name’s sake. Yea, though I walk through the valley of the shadow of death, I will fear no evil: for thou art with me; thy rod and thy staff they comfort me. Thou prepares a table before me in the presence of mine enemies: thou anointest my head with oil; my cup runneth over. Surely goodness and mercy shall follow me all the days of my life: and I will dwell in the house of the Lord for ever. The Bible is one long and flowing narrative about the goodness of creation, the brokenness that often comes through sin, and God’s work to restore all of creation to its wholeness. The 23rd Psalm reminds us that we will inevitably walk through dark valleys, but we will do so with the Lord by our side. It is therefore at our Thanksgiving tables that we discover the strange truth of what it means to sit at a table prepared in the presence of our enemies; our enemies might not be our families and friends, but our greatest enemy might actually be ourselves. And so, let us take a moment to reflect on our own brokenness and the grace that God has offered, such that we can then go around the table and truly express something for which we are particularly grateful for this year. Or, to put it another way, how have we experienced our cups running over this year? Lord, help us to be mindful of those who do not have a table such as this one around which we can gather, celebrate, remember, and rejoice in all that you’ve done, are doing, and will do. As we eat and feast together, let the breaking of bread be a foretaste of the promised resurrection made possible through your Son, our Lord, Jesus Christ. Amen. Make a joyful noise to the Lord, all the earth. Worship the Lord with gladness; come into his presence with singing. Know that the Lord is God. It is he that made us, and we are his; we are his people, and the sheep of his pasture. Enter his gates with thanksgiving, and his courts with praise. 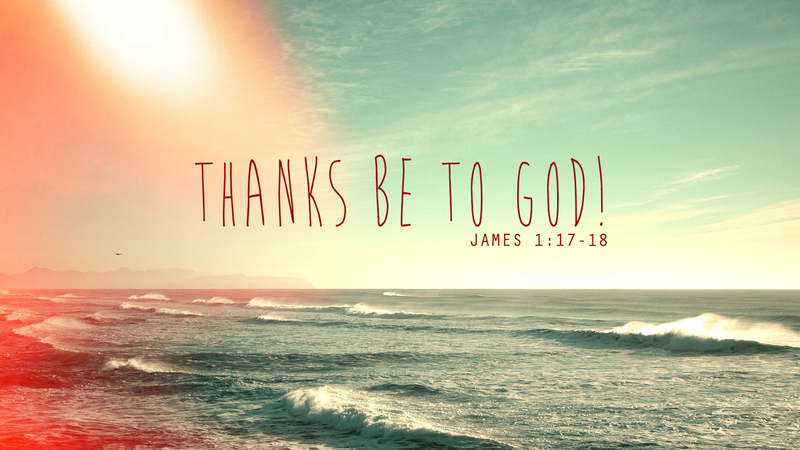 Give thanks to him, bless his name. For the Lord is good; his steadfast love endures forever, and his faithfulness to all generations. I am convinced that the days between Thanksgiving and Christmas Eve are some of the noisiest days in the year. There’s the noise of scratching together the proper shopping list, the boxes of decorations being dragged down from the attic, kids screaming in the car on the way to the grandparents’ house, extra services at the local church, and boxing other people out to buy the perfect present at the mall. And right at the beginning of all this noise, the time of frenetic and frantic noise, we have Christ the King Sunday. Like many Sundays throughout the liturgical year, this one has a special focus and significance. However, Christ the King Sunday is a more recent addition to the church calendar. Whereas Christians have celebrated the likes of Maundy Thursday and Pentecost for a long long time, Christ the King was only established as an official day in the liturgical year in 1925. It took the church nearly 1900 years to need this day the same way that we need it now. In 1925, Mussolini had been in charge of Italy for 3 years, a loud insurrectionist in Germany named Hitler had been out of jail for a year and his Nazi party was rapidly growing in power, and the entire world was suffering under the weight of a Great Depression. Yet, despite the rise of autocratic dictators, despite the lack of economic opportunities, despite the strange and uncomfortable silence between the two World Wars, Christ the King asserted, and still does, that Jesus Christ is Lord. Jesus the Christ is Alpha and Omega, the one to whom we owe our ultimate allegiance. This psalm and this day are a reminder of our first and primary allegiance to the Lord. Make a joyful noise to the Lord, everyone! Praise the Lord with glad and generous hearts; come into the presence of God and sing your hearts out. Know that the Lord is God. The Lord made us and we belong to the Lord. We are his people, the sheep of his pasture. With every breath give thanks to God and bless the name of the Lord. God is good; his steadfast love endures forever, and his faithfulness to all generations. We praise and sing with joy because God in Christ is the Good Shepherd. We jump to our feet and throw our hands in the air because God has already done so much for us. But if we’re honest, sometimes it feels hard to praise God during this time of year. For some of us, all those decorations and all those songs don’t hold the joy they once did. Rather than hopeful in expectation, we are fearful in deliberation. Instead of thinking about all the God has done for us, all we can think about are all the things we still have to do. And instead of praising God with a joyful noise, we struggle to hear God among all the sounds of this season. The psalmist proclaims a joy for the Lord that cannot be contained, a joy that must be shouted from the rooftops. But most of us don’t want to sing to the Lord in public. In fact, we don’t want to be confused with the type of people who do sing aloud in public places. However, Christ the King Sunday prepares us for Advent, the season dedicated to waiting for the arrival of Christ on Christmas. This is joyful, praise-filled waiting. And, ironically, in many churches it does not look like the congregation is making a joyful noise to the Lord. Rather, most churches are filled with people singing along looking slightly bored. 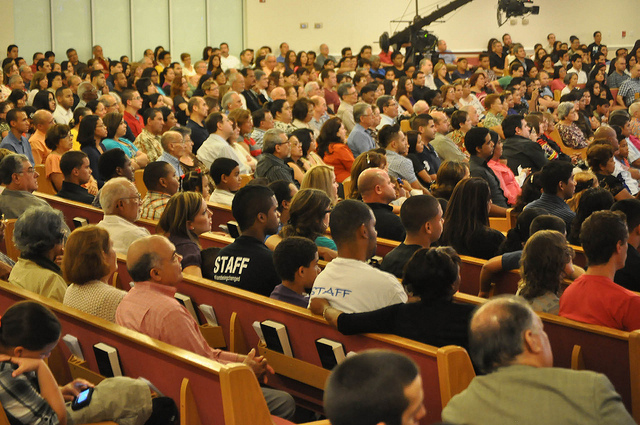 Thanks be to God that this church is not like other churches. Friends, I don’t know if we’ve ever sounded more joyful than when we sang that hymn last week. And even at the 11 o’clock service, when I knew ahead of time she was going to play it, I ran over to the drums and joined her for our final hymn and the whole congregation made a joyful noise to the Lord. It was a shot of joy to the arm, and it was a reminder that the Lord is indeed good. When a new widower attends church on a Sunday morning, he hears the familiar words of a Christmas hymn and instead of being transported to joyful memories from the past, all he can think about is the now empty spot next to him in the pew. When a mother goes to the store to purchase Christmas presents, she goes not with the excitement of how the children will react, but with the fear of how the family will be able to afford it all. When the refugee woman hears similarities between her story and Mary’s, she cowers in fear upon returning home and wondering if she will be caught and shipped back to her home country. The kind of joy the psalmist sings about is not a surface-level temporary experience. It is not a fall on the floor guttural sense of laughter that eventually fades. The joy of the Lord comes because God is still God, even when the world feels like its falling apart. The joy of the Lord comes because we are still God’s people, even when we feel like we’re all alone. The joy of the Lord comes because Jesus is King, even when it seems like other people are determining what happens in the world. When we feel the struggle of making a joyful noise amidst all the other noise, we fall back to God’s great gift of music. For music is the magnificent agent that lifts our hearts to commune with the heavenly angelic choir. Music transforms our hearts and minds such that we give thanks to the Lord through our voices, and we know that the Lord is good. A few summers ago I took a group of youth down to Raleigh, NC for a week-long mission trip. My particular group was assigned to help at the Hillcrest Nursing Center. Every morning we traveled to the facility in order to help lead the activity center where residents could play bingo, exercise together, and respond to trivia questions. It was quite the shock to the youth to go from the comfort of their homes and friends and family to sitting in a room full of people with limited abilities and limited communication. We tried pulling out the bingo cards and reading out the letters and number. I encouraged the youth to dance around the room to get the residents involved, but almost all of them just stared off into space. We even tried leading them through an exercise routine to the music of Michael Jackson, but it was as if we weren’t even there. To be honest, we felt pretty worthless. Having traveled all the way to Raleigh, it was hard for the youth to feel so unsuccessful with those near the end of their lives. But then I saw a discarded hymnal on a table, and I started flipping through the pages until I found Amazing Grace. Amazing grace! How sweet the sound that saved a wretch like me! I once was lost but now am found; was blind but now I see. All eyes in the room, though previously locked onto the walls and the floor, had all turned to the center where I stood with the hymnal in my hands. ‘Twas grace that taught my heart to fear, and grace my fears relieved; how precious did that grace appear the hour I first believed. The youth moved closer toward the center and started singing and humming along with the familiar tune that had all heard so many times before. Through many dangers, toils, and snares, I have already come; ‘tis grace hath brought me safe thus far, and grace will lead me home. The residents started perking up in their wheel chair, even the ones who had nothing to do with what we had done earlier, and some of them even started to mouth the words with us. The Lord has promised good to me, his words my hope secures; he will my shield and portion be, as long as life endures. The aides and employees who were wandering the hall started gathering in the doorway to watch what was happening, and a few of them even opened their hands and prayerfully joined in one voice. Yea, when this flesh and heart shall fail, and mortal life shall cease, I shall possess, within the veil, a life of hope and peace. Everyone in the room was singing or humming along, every resident who was previously lost to the recesses of their minds were found by the time we all joined together for the final verse. When we’ve been there ten thousand years, bright shining as the sun, we’ve no less days to sing God’s praise, than when we’d first begun. It was abundantly clear that for many of the residents this was the first time they had participated in anything for a very long time. From the tears welling up in the eyes of the employees while watching the people they served each day, to the smiles and wrinkles breaking forth on individual faces, to the youth singing and dancing in the middle of the room, the Lord was giving us the strength to make a joyful noise. From there we continued to flip through the hymnal and we joined together for a number of hymns. That previously silent room was suddenly filled with the words and tunes of Softly and Tenderly, Stand By Me, I Love to Tell they Story, O Come O Come Emmanuel, and we ended with Victory in Jesus. It was one of the most powerful moments in my life, and we get a hint of that same feeling every week when we gather here together. When I hear all of you say the Lord’s Prayer just as Jesus taught his disciples, with one voice, it sends shivers up my spine. When I look out while the choir is singing and I see some of you on the edge of your seats my heart flutters in my chest. When I open my eyes right before saying “Amen” and catch all of you faithful praying with tightly clenched eyes, I feel the Spirit moving through air. And I am filled with joy. Even the sounds that drive some of us crazy: the shuffling around of bulletins from someone in the back row, a toddler crying from a pew, a kid cackling on their way up the stairs toward Children’s Church. These are joyful sounds! They are a reminder of God’s wonderful majesty and mystery. They are a reminder that God still has work for us to do. They are a reminder that Jesus unites us in a way that nothing else on earth can. We worship the King of kings in Jesus the Christ. We come into God’s presence with gladness and singing because of all that God has done for us. And in response we can make a joyful noise. Amen. You shall eat your fill and bless the Lord your God for the good land that he has given you. When I was in college I lived in a house with a handful of other young men, though I was the only one who went to church. We had all, at some point, been involved with a church, but my roommates no longer felt the need to attend. However, as I was the one who usually made dinner for all of us, I insisted that we pray together before feasting together. For the first few months of living together they begrudgingly participated and politely bowed their heads as I thanked God for all of our blessings. After time they started holding hands with one another while I prayed and even asked for me to included particular things in my prayers. And on one particular night, when I inexplicably forgot to pray, they were the ones who reminded me to pray on behalf of the table before we ate. For years it was expected in many a Christian home that there would at least be a prayer before the common meal of dinner. Today, however, Thanksgiving has become one of the last refuges of prayer at a meal for many who follow Jesus. We should pray before every meal recognizing that, as we read in Deuteronomy, the Lord has provided so much for us. But prayer is a habit that has to be cultivated; it is not something we can just institute overnight. However, we all have to start somewhere. What would it look like to use this prayer before our Thanksgiving tables on Thursday? Or, perhaps more importantly, what would it look like to use this prayer every time we gather at the table to eat? Welcome one another, therefore, just as Christ has welcomed you, for the glory of God. It is hard to welcome one another, until we ourselves know what it means to be welcomed. We can imagine what we need to do and how we need to behave, we can get out the best silverware and the matching dinner sets, we can fill everyone’s cups to the brims, but until we have experienced being welcomed, we will struggle to welcome others. I spent the last week in Orlando, Florida with my in-laws for the Thanksgiving holiday. They were forced to practice a new type of welcoming and hospitality because they hosted their 7-month old grandson for the first time. In addition to the normal preparations for people visiting, they had to procure a stroller, pack-n-play, diapers, wipes, and an assortment of other necessary items. Moreover, they had to adjust their schedules to the sleeping habits of our son and reorient all of their plans around his general disposition and mood. And while we sat around the dinner table on Thanksgiving I was struck by how welcomed I felt throughout the week. They could have made assumptions about what we needed and then acted on it, but instead they approached us and asked what they could do to help. They could have become quickly frustrated with Elijah changing their plans but they adapted and made us feel comfortable. They could have expected us to change to fit into their way of life, but instead they changed to fit into ours. One of the most brilliant aspects of the Advent season is our anticipation of the way God fit into our way of life by taking on flesh and being born as a baby in a manger. Rather than giving up on humanity’s inability to repent and turn back to God, God comes down and meets us where we are. God, in Christ, welcomes us into the kingdom of God by connecting with us in ways that we can perceive and understand. The same holds true for the life of the church, and for us as individual Christians. We welcome one another just as Christ welcomed us, for the glory of God. When we encounter those for whom the church is a strange new world, we don’t just wait for them to “catch up,” instead we adapt our ways to meet them where they are. When we welcome people into our homes for food and fellowship, we don’t dominate the conversation with whatever we want, instead we seek to invite all present to shape what we talk about. When we discover new people sitting in the pews near us, we don’t make quick judgments about who they are based on their appearance, instead we remember how the Lord welcomed us and we do the same toward others. The topic of “blessings” occurs regularly in our Bible studies at St. John’s. We can be reading from the Old or the New Testament, we can be reading a Psalm or an Epistle, we can be reading a genealogy or one of the miracles of Jesus, and the conversation almost always turns to how we take out blessings for granted. There is something inherent in scripture that works like a mirror, forcing us to confront ourselves in the text. I use these words to mark the beginning of worship at St. John’s because gathering in our sanctuary is a gift that God has given. It is not something we should take for granted. But can you imagine how differently we would live if we started every morning with these words? Can you picture how wonderful it would be to contemplate the blessing of your life every morning rather than just once in a while? This week, let us use the words of Psalm 118 to mark our mornings. Instead of waking up and rushing to catch up with the train of life, let us take a slow breath and say: “This is the day that the Lord has made; I will rejoice and be glad in it.” If we do this, we will begin to stop taking our lives for granted, and we can give God thanks for all of our many blessings. After miraculously feeding 5,000 people, the crowd stayed on the other side of the sea. Though they had been properly fed by the Word, the loaves, and the fishes, when they discovered that this miracle man was nowhere to be found, they got into the boats and went to Capernaum looking for Jesus. “Okay, okay, so what do we have to do in order to perform the works of God? One of the great paradoxes of what it means to be Christian, is that we already know the end of the story while we’re stuck in the middle of it. Because we read from God’s word in order to remember the mighty acts of God in the world, we are all well versed on what happens in conclusion. Therefore it becomes nearly impossible for us to imagine the depth and meaning of these narratives in and of themselves. Try with me, if you can, to imagine that you are there among the crowd. Yesterday you were blown away by this nothing of a man who made something out of nothing. As you stood in line with your stomach rumbling, you were given more fish and bread than you had ever seen in your life. Now, you were so hungry that you ate until your stomach was about to explode, (just like many of us will do tomorrow…) and the next day, the miracle man was gone. As your hunger started to creep back up, you agreed with those around you to go looking for this Jesus. For us, the temptation to jump to the end of the story is great. We hear “bread of life” and we think about Holy Communion, we think about the last supper that Jesus shared with his disciples, we think about the crucifixion and the resurrection. And though it is important to know the end of the story, we’re not there yet. They don’t get it. The crowds that had witnessed Jesus’ miracle the day before knew exactly what they wanted, but thats not what Jesus is offering. What is belief? What does belief mean for each of you? Are we called to believe in God, in Jesus Christ, in the Holy Spirit? Is belief about accepting the bible as truth? Can we boil down our belief to something like the Apostles’ Creed? Often times belief in Christian living is compartmentalized into believing that God simply exists. The kind of belief that Jesus talks about with the crowds in John 6 is a different kind of belief. Belief is more than mental affirmation, belief is a world view, belief is a paradigm shift, belief is about a redefinition of reality. What we believe, shapes how we behave. Everything about what we do begins with belief; we believe in Jesus Christ and the things for which he stands, the way and the truth and the life he teaches us, the God whom he reveals to us, the grace and faith he came to offer us, the victory over death which he makes possible even for the least likely of us, the kingdom of God that he inaugurates for us. 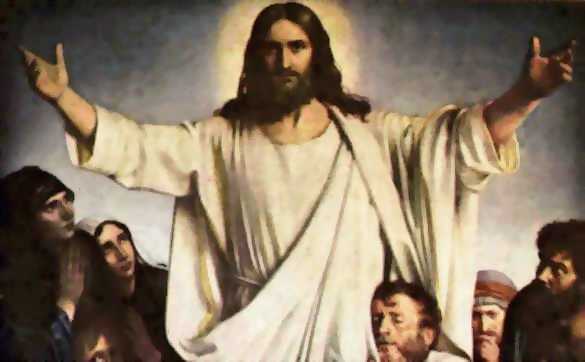 Okay Jesus, you want us to believe, to drop everything, to change our lives, to pick up our own crosses, to follow you. But why? Moses fed us with the manna in the wilderness, what can your belief offer us? Moses was Moses, a mighty servant and steward of the Lord. Yet what Moses gave to the wandering Israelites was not the bread from heaven; it is God the Father who gives you the bread from heaven, and that is being offered to you this day. What Moses provided, rather what God provided through Moses, was merely food. What Jesus offers the crowd is the almighty God. 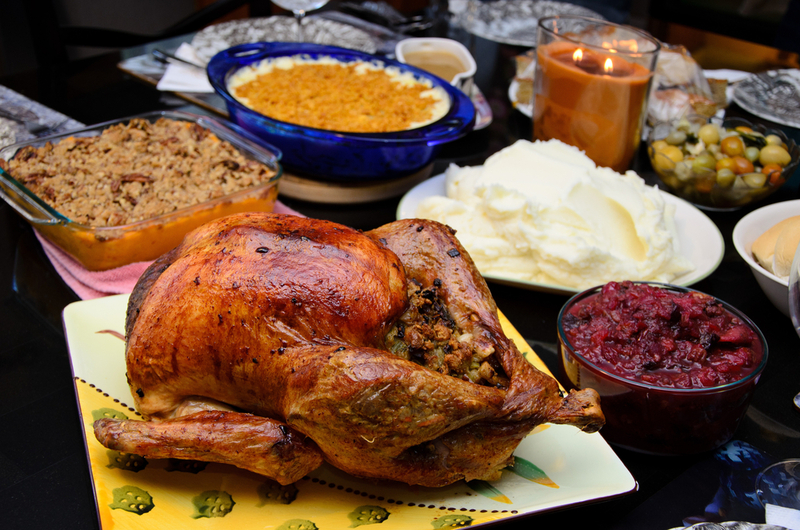 Tomorrow, millions will gather together with friends and family to celebrate the wonderful holiday of Thanksgiving. Crowds will develop in all of the airports, the roads will be filled with traffic, and kitchens will be teaming with individuals trying to concoct the perfect mashed potato – turkey – gravy – cranberry – stuffing combination of all time. After exchanging pleasant and cliche reflections on what we are most thankful for this year, most of us will partake to ridiculous degrees on the food set before us. Mountains of mashed potatoes will be eroded with rivers of gravy. Quarries of cranberry salad will rival seas of stuffing. 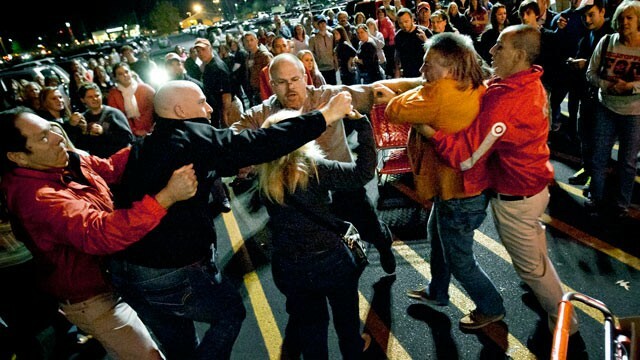 Perhaps most frightening is the fact that within 24 hours, we can go from thanking God for all the blessing in our lives, to fighting one another at Best Buy in order to purchase something to fill our insatiable appetite. We know what we want, but thats not what Jesus is offering. I like to think that, as the church, we have matured from our fragile days of discipleship in the first century. I like to believe that because we know the end of the story, we are better prepared to heed Jesus’ call to a life in the kingdom. I like to imagine that, as moderns, we are ready to take up our crosses in brilliant fashion and follow Jesus into glory. But the truth is, we are still standing in that crowd asking Jesus for the bread. We struggle so desperately to find meaning in our lives through failed relationships, the accumulation of material possessions, and vocational discernment. We hear the word of the Lord in scripture, and then quickly fall back away into the shadow of our lives. We thank God for our families and then bicker and fight as if they were not precious gifts in our lives. “I am the bread of life”; search throughout the scriptures, I challenge you to find something equally simple and profound in summarizing the Good News. This the gospel of Jesus Christ at its very finest! How ample in its sweep, how generous in its description, how impossible to evade. This is a passage to which we can all cling in the darkest moments in our lives. With this one sentence we discover an everlasting hope that will endure all things. 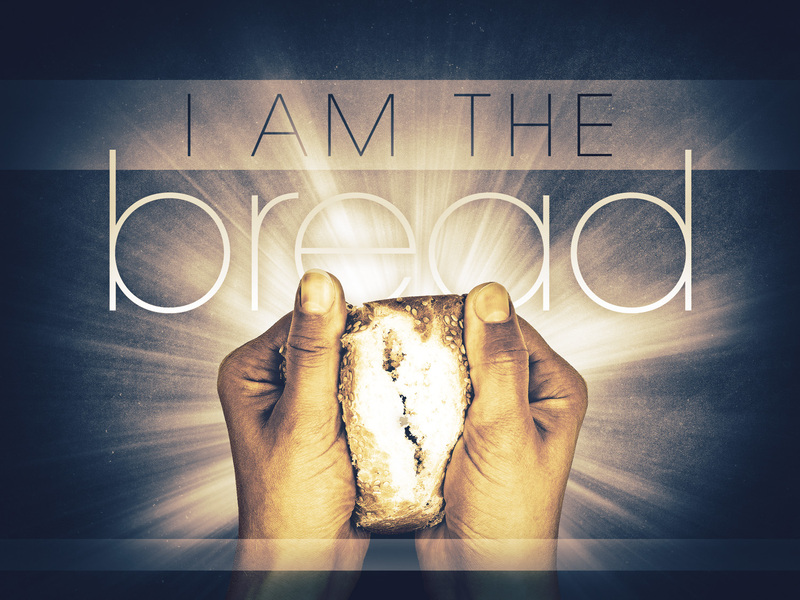 “I am the bread of life”; Jesus Christ is as important to us as the very food we eat. Indeed, Christ is more important to us than food. No amount of food or drink or any material thing will ever fill us the way that Christ does. Through the bread of life that Christ offers we receive strength to live out our faith, we are sustained and nurtured and loved in all things. “I am the bread of life”; The triune God is an end to all the craving and discontent in our lives. The bread of life roots our identities in the one from whom all blessings flow, the maker in whom we live and move and have our being. In a few moments all of you will be invited to Christ’s table to partake of him through the bread and the wine. Just as Jesus stood before the crowd to proclaim his identity as the bread of life, Jesus once gathered with his disciples to remember the stories of God in the world and share one final meal. What are you thankful for this year? How have you been trying to fill the voids in your life? If you want to be filled, if you want to find a sustenance in your life, if you desire to have your life transformed, if you need to be made whole, if you want to discover purpose and faithfulness in your life, if you desire to know God, if you hope to find peace in your lives, then come. Come to Christ’s table. Feast on the true bread from heaven, believe in Jesus Christ, and be filled by the Spirit.